A small sign in the bustling and over-saturated backpacker area of Thamel, Kathmandu, Nepal calls to us. It's small, shares no details, and is overpowered by the other bright signs around it, food carts, hotel- and trek touts, and live music coming from all directions, but it proclaims simply, "Cookie Walla". We must go. We walk down the dimly-lit alley, past a restaurant and a guest house, and nearly walk too far before a young man sticks his head out the doorway: "Cookie Walla?" We enter. We're shown into a small and dark space, asked to sit on some mattresses on the floor, and given our options by the energetic young man. 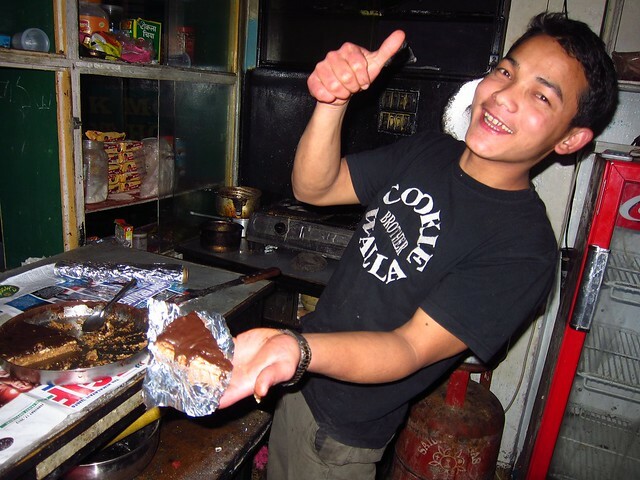 The Cookie Walla is a young Kathmandu resident with two talents: making delicious desserts, and making that popping noise you can make with your tongue and the roof of your mouth, about ten times louder than anyone you've ever met, with which he punctuates the end of nearly every sentence. We figure he chose the profession that best utilized his two talents, and boy are we glad. The frozen concoction we ended up with, and eagerly devoured on our walk home was made of a cookie crust, ice cream, chocolate sauce, and bananas, and wouldn't be out of place at a midwestern barbecue. It's serendipitous experiences like this one, ones that we stumble upon accidentally and would never find their way into a guide book, that will surely be some of our favorite and most-lasting experiences of our journey. Your trip just keeps getting better and better! Glad I can travel vicariously through your blog and can’t wait to see the photos and hear the stories from Burma! Thanks KC! We thought of you while in Nepal (and India)- we can see why you love it there so much! Thanks for all the tips. Burma is amazing. Posts to come soon. Awesome! So glad we helped you find it. Hope you’re enjoying Nepal! Absolutely loving it, and the banana/cookie crust/ ice cream dish was well worth tracking down! Amazing!